Pucker up for the camera! There seems to be a trend for overly-plumped lips and it doesn't stop with celebrities. You can walk through your local mall and see an array of badly blotched injections...or do they supposed to look like that? The unfortunate news is that some celebrities fall victim even with high dollar surgeons on the payroll. Luckily for them, these injections are only temporary and wear off after a few months (2-6). Take a peek at some of the worst Hollywood lips ever captured by the camera. The unnatural pucker is definitely too much when it draws attention away from your natural beauty. 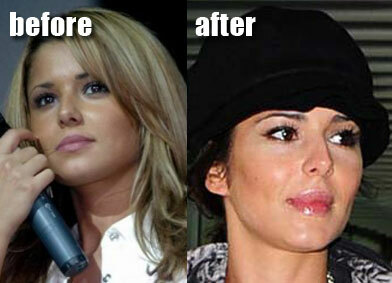 Cheryl is adored in the UK for her natural good looks, but when she stepped out with overly extended lips she appeared extremely artificial and considerably less attractive. This is the definition of botched injections, as it appears the songstress had some sort of adverse reaction to the material. Love makes the list for the worst lips in Hollywood, but at least she came clean and openly admitted that the strange appearance of her lips was the result of bad plastic surgery in her younger years. She had what looked like sores or scabs on and around her lips and many suspected a skin disease. Fortunately for her, and i use the term lightly, it was only a temporary result of plastic surgery gone wrong. With corrective surgery, Love was able to return her mouth to something more natural looking. Unfortunately, she will never be restored fully to her former beauty, no matter how many more cosmetic procedures she endures. It's always a shame when women with naturally plump lips decide to enhance them far too much. The botched injections on Vanessa Ferlito are the perfect example of unnecessary plumping. She is also rumored to have undergone plastic surgery for a nose job, which is quite evident from the before and after picture. Melanie is the perfect example of how too much work on the lips leads to even more work to fix the lips. Her botched injections and surgeries led to massive lips that looked more like an allergic reaction than an intentional self improvement project. Eventually she started the process of correcting the damage and her lips came back down near their natural size. She still makes the list of Hollywood's worst lips, as a precaution that has to be highlighted for the good of mankind. Forget botched injections. 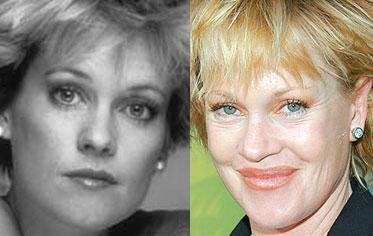 Meg Ryan is believed to be suffering from a bad case of botched lip implants. She was already well known for her pouty, kissable lips, but her augmented lips took things in the new direction, a direction littered with wrong turns. Lets just hope she rebounds from this debacle, because shes truly one heck of an actress. Everything about Lindsay Lohan turns into a media spectacle and never ending debate. While her lips are suspected of being unnaturally plumped, the star insists she has not had injections, fillers, implants or anything else done to her lips. Take a look at our before and after pictures. Do you think she is telling the truth? I think this is an open-and-shut cell...I mean, case! Swedish beauty Victoria Silvstedt makes the list of the worst lips in Hollywood because she simply did not need the work. She already had a beautiful mouth that men around the world wanted to kiss. Now she has enormous lips that overtake her face. What a shame. This is the definition of "too much of a good thing". Tisk tisk all over you! Is it an upper lip implant or collagen? Lil Kim isn't openly broadcasting what caused her overly plumped lips, but they are jumping off her face and you can't miss them. This is yet another sign of botched injections or surgeries that were not necessary. 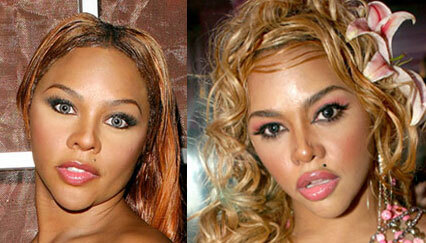 But then again, Lil Kim has become synonymous with the phrase "bad plastic surgery". 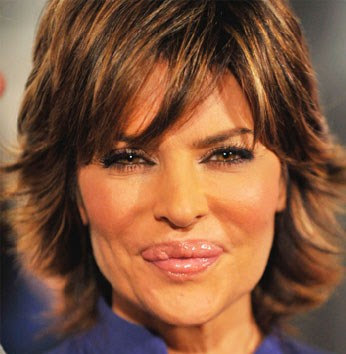 The history of Lisa Rinna's lips have been nothing short of a roller-coaster ride. If you recall, Rinna had an unfortunate experience with silicone lip injections back in the 1980's and developed significant scar tissue, causing her lips to become lumpy and uneven. It wasn't long before her bulbous lips began to define her, perhaps even elevating her career in a sense. However, Ms. Rinna was sick and tired of all the added attention her lips were receiving, so she chose to undergo lip reduction surgery in an attempt to restore some order to her whoopee cushion kisser. The highly coveted number one spot on our list of the "worst celebrity lip injections", goes to none other than American actress, Nikki Cox. A true beauty who made a dreadful decision to overly enhance her lips. I choice that has literally transformed her career in show business. The photo pretty much speaks for itself. Whenever you hear a young girl question why she can't have plastic surgery, show her a picture of Nikki Cox. This is an example of how botched injections and other surgeries can shatter beauty, rather than enhancing it. Wow, these celebs are so dumb, getting there lips done.. who ever gets plastic surgery deserves their punishment. God made us the way we are and we should respect him and keep ourselves beautiful just the way he made us attractive or not! What - no room for Marge Helgenberger of CSI!